Eating a hot flavourful meal that has been easy and quick to prepare can sometimes feel like the highlight of your day when you’re on the trail. After all, who could seriously say no to a steaming bowl of rehydrated chili after 20 miles of trudging? The right cookware can make a huge difference to how convenient your meal prep is, and how light your pack is! Luckily, there are some great options out there for camping cookware to suit everyone. This article will review 13 of the best backpacking cookware sets currently on the market and then talk a little about how to choose the best set for your needs. I Want a Good Camping Pot! What do I need to Know? This is the pot for the minimalist hikers out there who want a mug, bottle and pot combined. It’s not going to work for everyone, but if a one pot solution is what you’re looking for, this pot is it. The lid screws shut so the pot can be used for transporting extra water or pre-soaking food while you hike. The screwing lid flips upside down when cooking so that the thread doesn’t get in the way of the snug fit. Handles fold away and the inside of the pot can hold a small gas canister. Not cheap. Though no good quality titanium pots are. 700ml is possibly too small for some functions. Small, ridiculously light and versatile, this is the one stop pot for ultralight hikers. 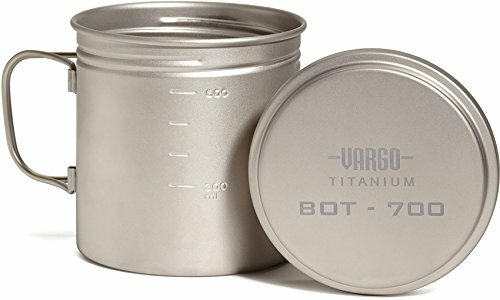 This 750ml pot is similar to the Vargo Bot but with an extra 50ml capacity and without the screw top lid. 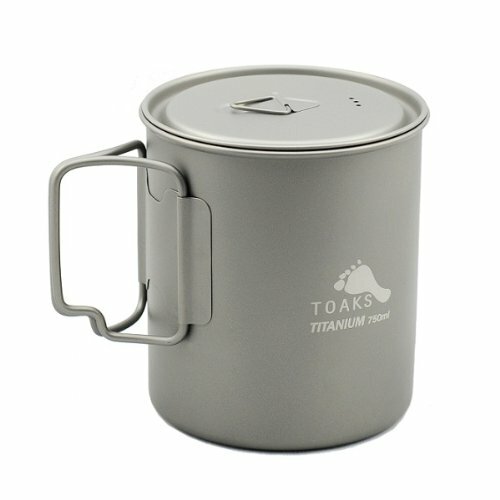 It is a top quality Toaks pot, well known for their titanium camping cookware. The lid has small holes for straining out liquid. The whole thing weighs an incredible 3.6 Oz. The inside is marked with graduations in ml and oz. There are no cons to this pot if you know what you’re buying. Among the best hiking cookware options out there for ultralight hikers, it doesn’t get much better than this pot. This is another pot for the minimalist, ultralight hikers out there. It weighs just 4.7 Oz and is convenient for use as a small cooking pot and mug. The extra feature of this pot is the hanging handle which allows the pot to be suspended over a campfire. 750ml is a convenient size for one person, though it’s more of a cup than meal size. Made of extra lightweight titanium. Compatible with either standard stoves or being suspended over a camp fire. Likely a little small if you have a big appetite. 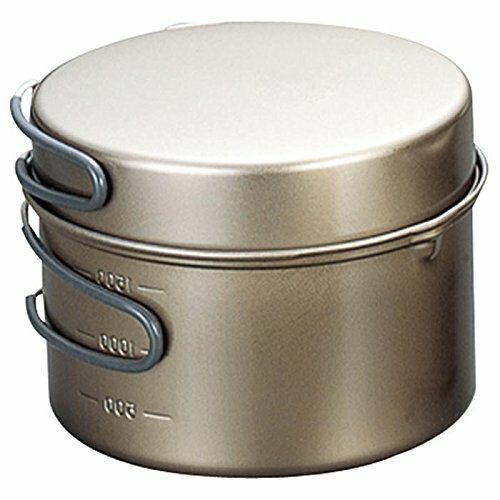 This pot is the ideal size and design for one person traveling ultralight, with the option of using it over an open fire. This is a coated 1L aluminum pot with a lid that doubles as a small frying pan, or a plate. It is non-stick, light weight and pretty durable for coated aluminum. Non-stick surface makes cooking and cleaning easy. Lightweight at only 10 oz. Silicone coated handles for easy grip. Versatile 1 L volume is just big enough to feed 2 people. The frying pan is a little small to be functional but is good enough for a couple of eggs. Non-stick coatings aren’t bullet proof so you’ll need to stick to plastic utensils. This is one of the best hiking cookware options if you want a non-stick pot that is pretty light weight and a good, functional size. This is a pure titanium 1200ml pot with a 400ml bowl which doubles as a lid. 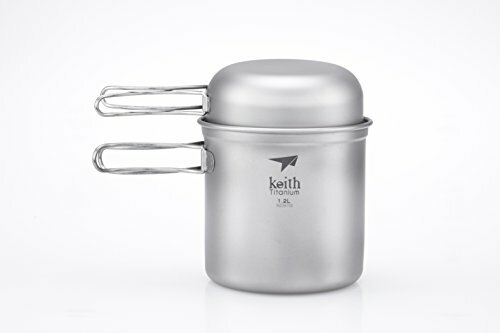 Keith is a lesser known brand of titanium pots but the quality appears to be on par with Evernew. It is a durable, good quality pot that won’t buckle under pressure like some cheaper aluminum ones will. Weighing only 6.5 Oz. this is a very lightweight pot. A good volume for cooking substantial meals for 1 or 2 people. The lid doubling as a bowl makes this a versatile pot for hiking with. Both parts have long handles making them easy to hold. Uncoated titanium isn’t non-stick so these pans are designed for boiling unless you have plenty of oil on hand and are careful not to let things get too hot. A good quality, reliable titanium pot that is ultra-lightweight and an ideal size for backpacking. It is among the best backpacking cookware for 2 people. Evernew are a well-respected brand in the world of titanium pots. This is another pot and frying pan combo where the frying pan doubles as the lid and can then be used as a plate if needed. But this pot is unique, being titanium with a non-stick coating which is not a common combination. Silicon ceramic non-stick coating mean you can now fry on your titanium frying pan! 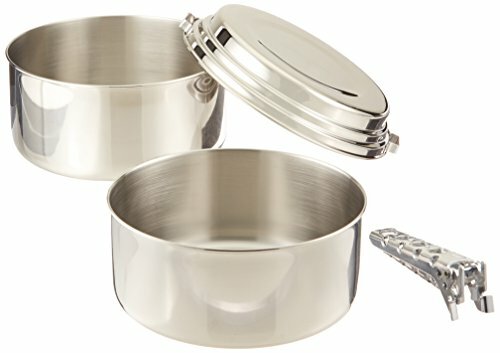 Being titanium, this pot and pan combo is extremely lightweight. Handles have silicon grips and fold away easily. You’ll need to be careful with the non-stick coating, to prolong its life. The 0.9L pot and 0.3L lid combo is perfect for 2 hikers or a solo hiker with a big appetite. It is the best backpacking cookware set for hikers watching the weight of their packs who want a non-stick alternative. 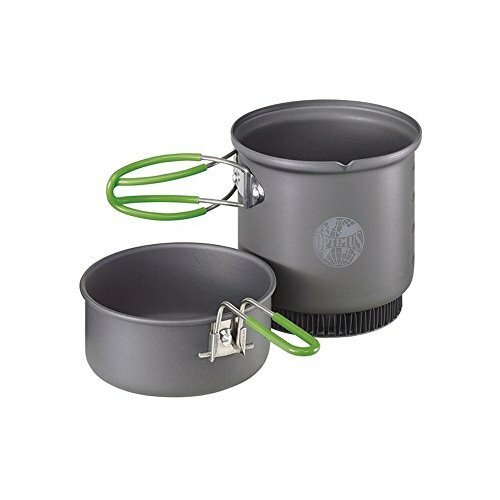 Similar to the Primus LiTech above, this 0.95L anodized aluminum pot and pan combo is a failsafe option for newbies to the backpacking world. It is the most affordable pot on the list and strikes a good weight-volume ratio. Heat Exchanger reduces water boiling time by 20%. 10 Oz is very lightweight. Frying pan doubles as a lid and a bowl, and has its own long, folding handle. Both handles are silicon coated. The non-stick surface requires gentle treatment. This is the best backpacking cookware set for beginners, being affordable and lightweight. When 1 titanium pot isn’t enough, this is the set you want. 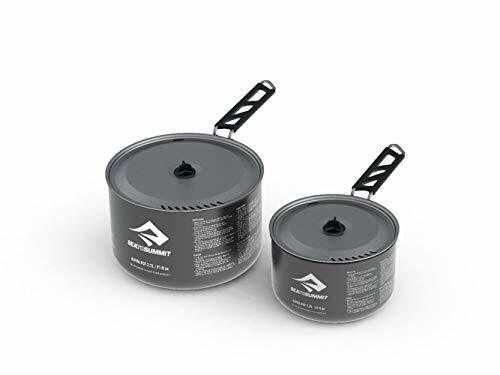 Snow Peak is a top of the line brand when it comes to titanium camping pots, and this set of 2 definitely won’t let you down. The lids have their own long handles and can be used as frying pans and plates. 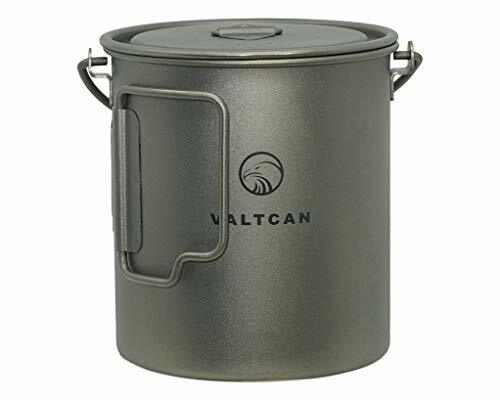 The 500ml and 800ml pot volumes are versatile and practical for backcountry cooking. The smaller pot and lid fits neatly inside the larger pot. I’m yet to find a con for these pots! This is the best ultralight backpacking cookware and probably the best titanium backpacking cookware. Ideal for one or two people. This 1.4L anodized aluminum pot comes with 2 bowls, mugs, “foons”, a straining lid, and a bag that doubles as a small basin. It is lightweight and functional. Ideal for groups of 2, this sturdy pot will fulfill all of your cooking and water boiling needs while the set has your personal eating-ware covered in a lightweight, compact package. Reasonably lightweight at just over 1 lbs. The lid has a plastic handle and holes to act as a strainer. The whole set nests together into one compact package. Halulite material conducts heat quickly and evenly. The “foons” are the weak point of this set. Users recommend replacing them straight away. This is the best backpacking cookware set if you appreciate the convenience of having sole purpose plates and cups. This stainless steel pot set is a on the heavy side, but it can’t be beaten when weighing up price and durability. The 1.5 L and 2L pots are huge so one by itself would more than suffice and save on weight at the same time. 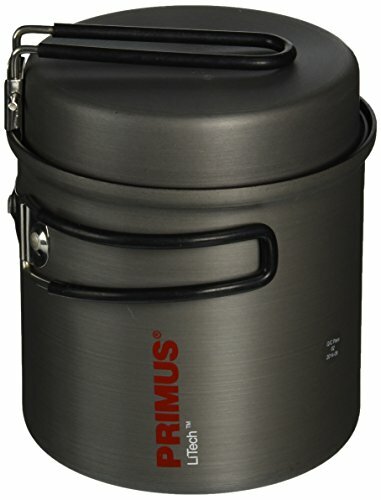 Stainless steel is the most durable option for camping pots. The simple design has both pots sharing the same lid and clip on handle. The deep lid can also be used as a plate. This pot set is heavy when compared to aluminum or titanium weighing 1 lb. 10 oz. 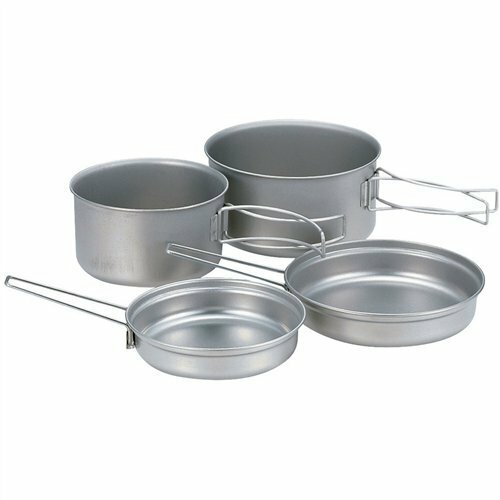 This is the ideal pot set if you’re not too concerned about weight and would appreciate the size and durability of these top quality stainless steel pots. This 1.2L and 2.7L pot set is a reliable option from Sea to Summit for groups of 2 or 3 hikers looking for a little more volume but in a lightweight, top quality package. They come with some cool little features like the silicone handle on the lid which lets you hook it on the side of the pot while cooking to save putting it on ground. Made of durable, hard anodized aluminium for non-stick cooking. The lids have slots for letting out steam or water for straining. Weighing in at 16.2 Oz. this is a reasonably lightweight set of pots. Stainless steel handles have silicone grips and fold away easily when not in use. 2.7L is absolutely huge for a backpacking pot but could suit groups of 2 or 3. These 2 pots are a great option for small groups, being large volume but pretty lightweight. 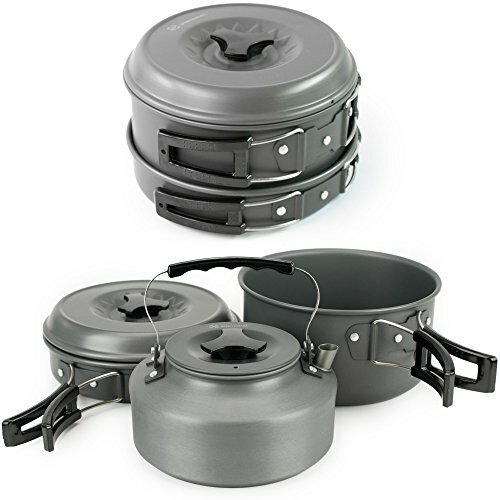 This is the pot set for hikers traveling in twos or threes who want some versatility in their cooking options and aren’t too concerned about weight. The pots are a little larger than necessary and the plates and cups may or may not be unnecessary depending on your preference. Packs down into a compact, nested package. Comes with 2 pots (1.5L and 2.5L), 1 strainer lid, 2 polypropylene bowls and mugs. The pots are hard anodized aluminum which is durable and non-stick provided you look after it. 5L is massive for a backpacking pot. 1 lbs 12 oz is pretty heavy for a pot set. If you don’t mind the weight and want the luxury of 2 sizeable pots and the accompanying bowls and mugs, then this could be a good option. This is the best camping cookware for multiple people. This is an option for campers who won’t be hiking far to camp, or backpackers who are really determined to do some gourmet cooking. Similar to the MSR kit above, 1.5lbs is too heavy for most backpackers, but could work for a small group. This is a very versatile set that could stand you in good stead if you want options, as you don’t necessarily need to take the whole set with you on each trip. Coated with a durable Teflon non-stick coating for easy cooking and cleaning. 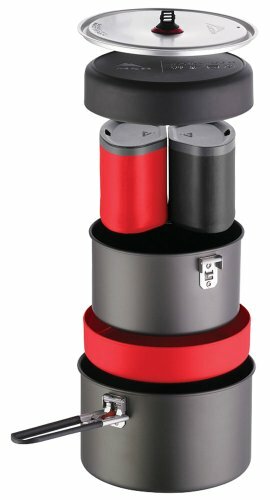 The pots nest into each other into a reasonably compact package. A little too heavy and bulky for longer distance hiking/backpacking. 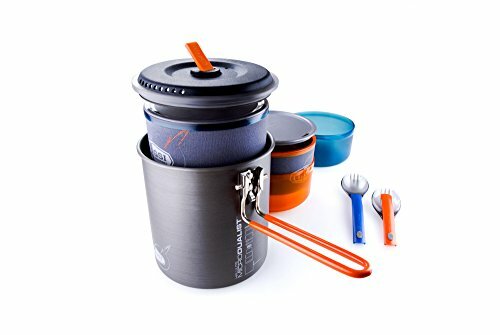 This is the best camping cookware if you’re traveling in a group of 3 so you can share the load, but it’s a little overkill for the majority of backpacking adventures. Food on the trail is a subject close to my heart. Sure, there are those who can go months eating just couscous or soaked freeze dried meals. I will shamelessly admit that as much as I love hiking, the right meal can sometimes be the best part of the day. But, nothing’s quite as simple when you’ve gone bush. There are things to consider when it comes to choosing the best backpacking cookware. Weight and material go hand in hand when it comes to pots. There are generally 3 options. These are, stainless steel, aluminum and titanium (granted there are different types of aluminum pots such as coated or hard-anodized). Stainless steel is the most durable, but it is also the heaviest. Stainless steel is non-reactive and completely non-toxic. Titanium is by far the lightest material. Ridiculously so, in fact! It’s so light you’re likely to throw it behind you accidentally when you pick it up. It is also very safe to cook with being non-reactive and non-toxic. However, it is pricey. You’ll want to be a pretty committed hiker to invest in a titanium pot. Then again you’ll have it for life so this is the option I personally recommend. Whether or not your pot is non-stick will greatly affect how you cook and what you cook. In general, titanium and stainless steel are not non-stick and so are better suited to boiling water and cooking things like pasta and soup. It is possible to fry with them but you’ll need a lot of oil. Also, titanium pots are usually very thin resulting in very fast cook times and a high likelihood of your food burning if you’re not careful. Volume is a little dependent on preference, but it also takes a little experience to figure out the ideal size for you. If you haven’t done much backpacking and cooking on the trail, you might look at some of the pots above and think they’re far too small for any real cooking. We have found that carrying two pots, one 1L and the second a little smaller, works perfectly for our hiking-fuelled appetites. I personally think that anything over 1L is unnecessary for backpacking unless you’re traveling in a group of 3 or more. If you’re just one person, you’d be surprised how effective one 750ml pot can be! You’ll want to decide whether you want separate plates, bowls or mugs or whether you’re happy eating directly from the pot. The design of the handles can be worth considering depending on the kind of stove you have or whether you want the option of cooking over an open fire. In general, open fire cooking is not recommended for coated aluminum but is fine for stainless steel and titanium (though you’ll have to make peace with a slightly blackened look on the outside of your pot!). That’s concludes this article on the best backpacking cookware sets. Hopefully, you’ve got your eye on a sweet new pot to make your meal prep a breeze the next time you hit the trails. Feel free to comment or download our e-book about solo travel safety.